It is not widely-known, but alongside running Red Dot’s cricket events, I lay claim to a stunted career as a child star in England. On Boxing Day in 2001 I executed one single, simple line that brought the British nation to tears – “Mrs. Chips is dead!” I whispered. I was playing the role of a wartime schoolboy in the ITV drama Goodbye Mr. Chips, starring that bloke from Men Behaving Badly. Soon I was pictured pondering into the distance on the inside cover of what was the UK’s 24th best-selling DVD in WH Smith’s end of summer sales the following year. And hence, film auditions, including a call back to Richard Curtis’ Love Actually and even Hollywood’s Peter Pan,came calling. I started performing Shakespeare at school and the world was at my feet, but alas the big break never came. I just don’t know why not. Perhaps it was the distractions and confusion of adolescence that throw me off course from what was surely my calling. Lying awake in the middle of the night, I sometimes used to ask myself what could have been. The decision to move out to Sri Lanka two years ago has laid that childhood ghost to rest. I suppose I should feel proud to say that (very part-time) I am quite quickly working towards a respectable acting and modelling CV on the island now. I can report that I am on the books of Primates Model Bank in Colombo, and my agent Sanath wants to meet to discuss exactly how I should brand myself within the industry here. Two weeks ago I trod the red carpet for the premier of a cricket film I was in that I can’t pronounce the name of, or understand the language of. There were no toilets on set shooting this film, so we used the surrounding tea plantations. Last Saturday I was driven an hour outside Colombo at 4.30am to a hillside village to be dressed in an army camouflage and bright orange tank top to play a teenage Australian cricket-playing tourist in an Sri Lankan cream soda TV commercial. 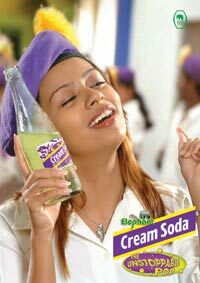 I stood out in the blistering sun, working a 17-hour-a-day weekend, doing The Sprinkler Dance (as famed by English cricket’s Ashes winning heroes) to Indian pop music and being force-fed bottles of fizzy drink with a camera in my face. “Glup– one – two! Gulp – one – two!” the director screamed as fizz shot up my nose. As the evening sun fell behind the hills, I retired exhausted in the camera crew’s truck and caught a glimpse of myself in the wing mirror and had to ask God how it ever ended up like this. Next Sunday I play the role of a dead German soldier for a day. Hey, the Red Dot team is even cooler than I thought!